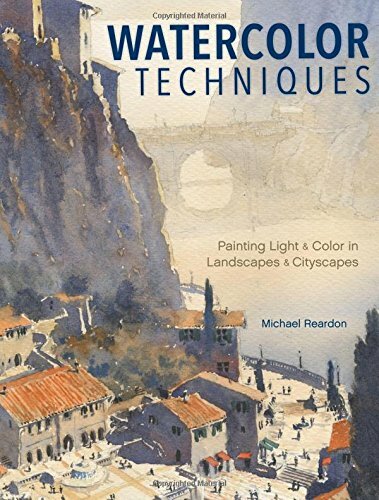 Michael Readon's Watercolor Techniques is a wonderful book that collects tips, techniques and demonstrations that any watercolour artist can learn from. It's suitable for beginners as well as advanced artists. Highlight of the book are the step-by-step demonstrations with explanations. It's really helpful to see how a watercolour painting progress from a value sketch with pencil, to the final product. Each step is shown and the technique and colours used are clearly and concisely written. There are 8 of such demonstrations and after absorbing all the knowledge, I'm pretty sure you'll be able to subconsciously remember all the steps. In addition to the demonstrations, there are also snippets of information regarding different topics on watercolour painting, such as using values, light, shadow, mixing paints, creating washes, using watercolour for architecture and more. By the way, most examples shown are paintings of landscapes and architectures. The tips and techniques are not unique to this book so the difference if you get to see them being applied in the artist's style. It's an insightful book. It works well as a complementary book to those beginners how-to-paint-watercolour books. Experts should be able to gleam some insight from Reardon as well. The numerous beautiful paintings in addition to the text definitely makes me want to refer to the book in the future. You can just flip to any page to get inspired. If you like this book and the way the information is presented, I also recommend Mastering Watercolors: A Practical Guide by Joe Cartwright and Making Color Sing by Jeanne Dobie.